I have talked some on the design and use of the New Rangers blades. I hope you can take the time to check out my different pages about the Rangers. There is a part of the design that I find very interesting. On the picture this is shown and I have already mentioned about the stop function. The interesting area or place is used for the stamps + it is the result of the grind and shape of the Wenger blade. 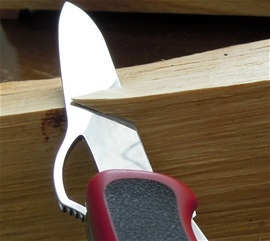 When cutting in different materials the curve will prevent damages on the handle scales. I will explain why. The Wenger scales are usually assembled by a press fit method and if a material should somehow get between the scale and blade during harder cutting tasks, then the result of this could be that the scale would be bent or presses out in front. 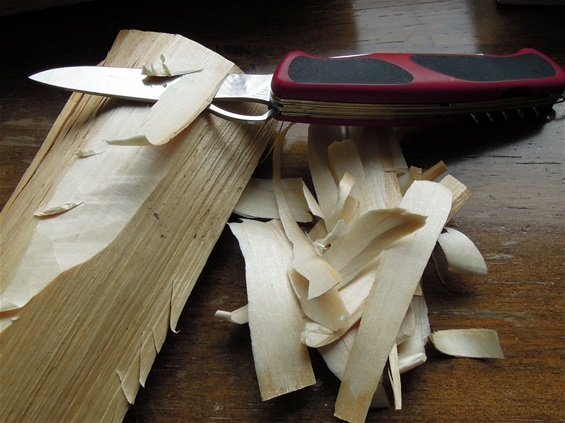 When cutting in wood the stop function on the edge and the curve on the blade will prevent this from happening. This you can test for yourself on different materials and especially on wood. If we look outside the inner part and curve then you can see on the picture how the blade cut into birch with the direction of the grind and edge. There are advantages with a rather slim blade and how the Wenger blade is designed. On the next picture you can see how easy the blade cut tiles of birch. It is a very good cutter!